Searching for Super Special Christmas Gift Ideas? Here are some for you to consider when purchasing that perfect gift for friends, lovers, mothers, fathers, sons and daughters. That’s the beauty of personalised gifts; they speak volumes about who you are while making someone else’s day the best it can be. 1. Is his passion totally extreme? If you know a man with a passion for extreme sports, but don’t know what kind of item to purchase that will satisfy their crazy desires, here’s a gift that will fill that space – over and over. We all know how it feels when someone gives you a gift from the heart. It’s like no other feeling on earth. Collect together the best photos of your friend doing his extreme thing, for example base jumping, trail bike riding or abseiling, and design a one-of-a-kind collage just for him. Does he have an insatiable need for speed? Here’s a safer way to encourage his love of fast cars. For a man who loves cars, few things are sexier than putting the pedal to the metal. That’s why our metal prints are an ideal gift. You may not be able to afford to buy her the trip of a lifetime, but this canvas collage will give her the next best thing – inspiration to save. 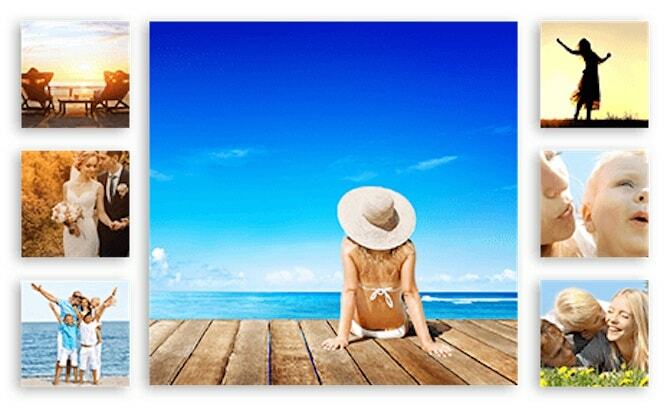 This themed ‘Live Travel Adventure’ collage canvas is the perfect gift for the girl with the travel bug. If she’s new to travel, select a few exciting photos from our massive online photo library. Here we’ve chosen Bali, India and Aruba. But we’ve got thousands of photos to choose from – Paris, New York and London. The list is endless. If she’s already a seasoned traveller, you will no doubt find hundreds of photos on her Facebook or Instagram page. As long as the quality is suitable, we can make it work. Know a new mother who’s shown tremendous resilience and courage? Wait. Isn’t that all new mums? This gift is about warming her heart all over again. The magic of photo collages is they give you the opportunity to display multiple photos on the same print. This tender silhouette baby carriage collage provides frames for 10 photos. Very handy when you’re struggling to choose. And cute to boot! Whether your selection is from a professional photo shoot you’ve commissioned or simply sourced from your own personal gallery, this gift will make a new mother’s Christmas. He’s their hero. They listen to every word he says. They watch every move he makes.